One of the biggest draw cards to visiting East Africa is of course the chance to see the greatest wildlife show on earth: the annual Wildebeest Migration. But when is the best time to see it? And where? And what can you actually expect to see? Unsurprisingly, queries abound, so we’ve put together some answers to the most frequently asked questions from travellers about the migrations – plus some tips to help you plan your trip of a lifetime. Each year, approximately 1.5 million wildebeest and 300,000 zebra and gazelle stragglers gather up their young and make the trek from Tanzania’s Serengeti National Park to Kenya’s Masai Mara in search of food and water. Predators follow the Migration closely, waiting for an opportunity to strike weak prey as they make their way into different territories. Their journey follows a continuous clockwise circle, covering some 2,900 kilometres (1,800 miles), and is notoriously fraught with peril. Annually, an estimated 250,000 wildebeest die en route. The precise timing of the Migration changes annually as it is an unpredictable and spontaneous natural event dependent on the rains. It is by far the greatest mass movement of land mammals on the entire globe, and has been listed as one of the Seven Natural Wonders of the World. A storm of Wildebeest in Kenya’s Masai Mara. Image c/o Shutterstock. 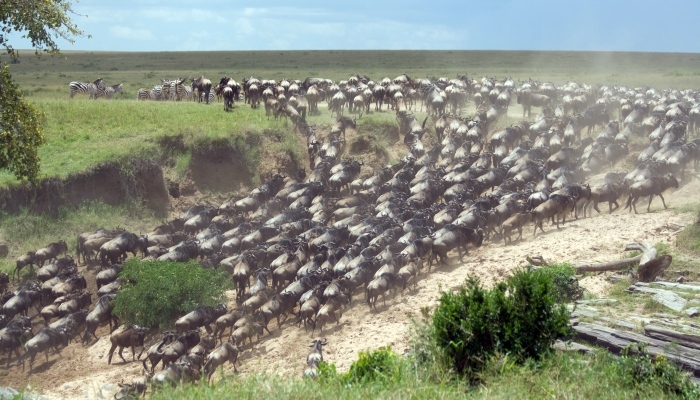 We’re often asked, ‘When actually is the Migration?’ Really, it’s a year-round event, the herds moving in a constant clockwise circle throughout the Serengeti and Masai Mara. 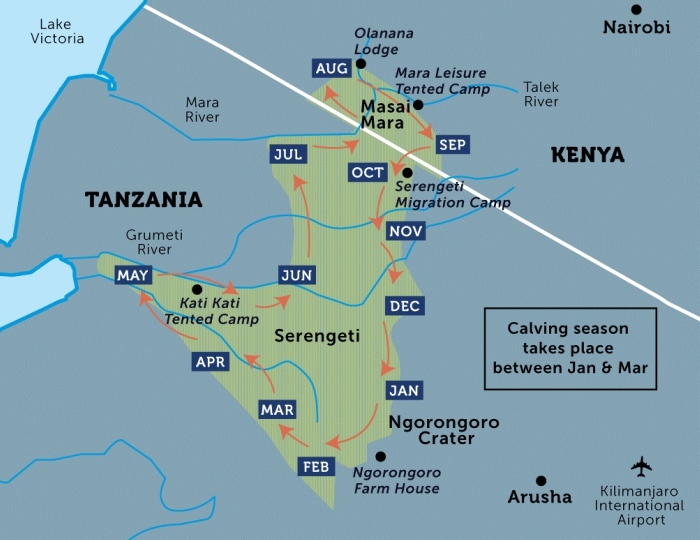 In Tanzania, the calving season takes place in the southern Serengeti between January and mid-March, before the Wildebeest Migration begins heading towards the western Serengeti in June. Most of Peregrine’s small group Tanzania trips also visit the UNESCO-listed Ngorongoro Crater – the world’s largest inactive, intact, and unfilled volcanic caldera. Although there are thousands of wild animals living inside the crater, they don’t actually partake in the larger Migration, as the rich volcanic soils provide the nutrients they need to survive. Typical route of the Migration. It’s important to note that above is a guide only. The Migration is a natural phenomenon and no year is the same as the last, so there’s never any guarantees. In 2013, for example, the Migration actually re-entered the Masai Mara for a second time just two months after they left due to a lack of rain in the Serengeti. Travellers on safari in the Mara as late as December were lucky enough to witness the plains covered in wildebeest. So which is better – the Serengeti or the Masai Mara? Well, Tanzania boasts the open plains of the Serengeti, as well as the epic experience of seeing the wildlife of Ngorongoro Crater in 4×4’s. If you visit between January and mid-March and are lucky enough to catch the calving season (wildebeest young are almost all born during a three-week period – an estimated 400,000 each year! ), it’s a pretty special experience. On the other hand, Kenya’s Masai Mara covers a much smaller area than the Serengeti. 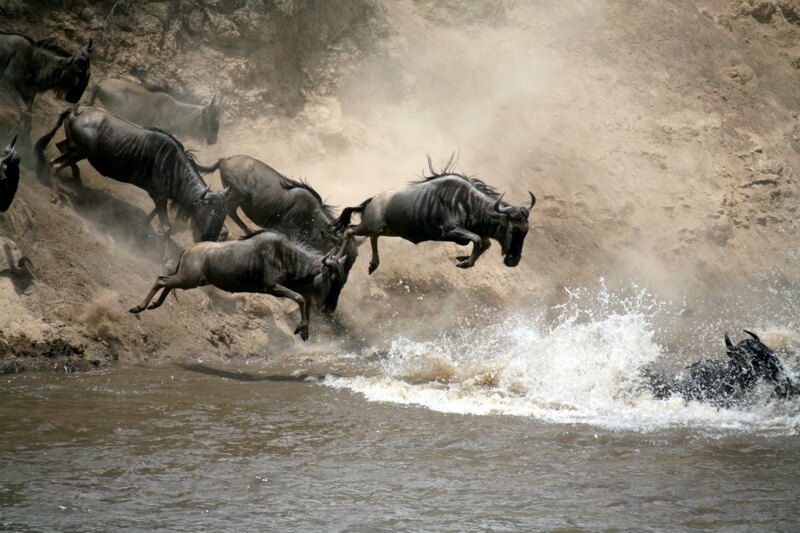 Some argue that the concentration of wildlife is therefore much higher once the Migration enters the Mara. One thing’s for sure: the Masai Mara really offers the quintessential safari setting many of us have spent years dreaming about! 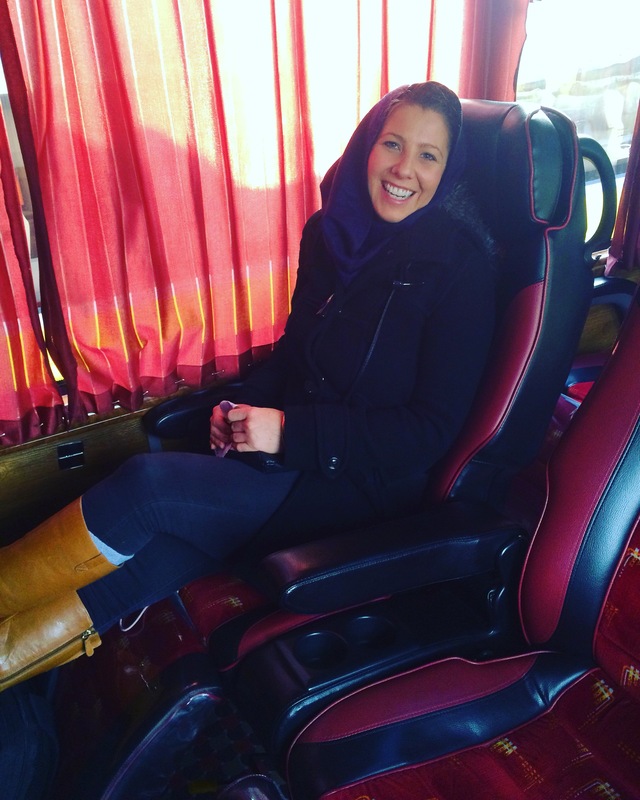 But here’s the thing: if you’re going all the way to East Africa – you might as well do both! Even if you’re on a tight schedule, the Masai Mara and the Serengeti are actually part of the same National Park, separated only by a (fake) border. When we say ‘fake’, we mean you can literally be standing in the Serengeti, take a step to your right and be in the Masai Mara. So it’s easier than you think. You can see both the Serengeti and the Masai Mara on Peregrine’s 12-day East Africa Discover trip. Will I see a river crossing? 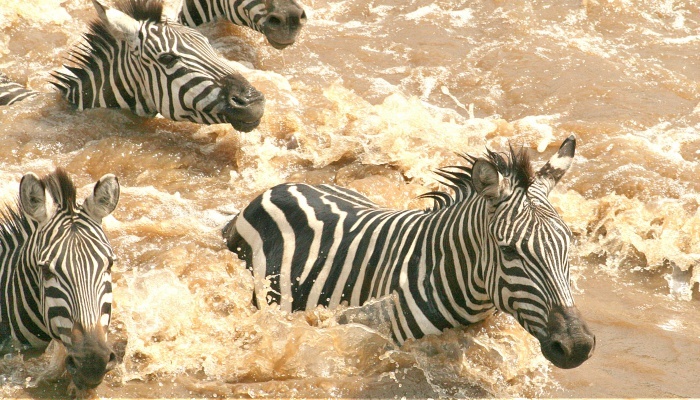 Zebras brave a rushing river in Tanzania. Image c/o M. Kaleku. Do we adapt our itineraries to follow the migration? In short, no. Overall, we still visit the same places, and stay in the same camps or lodges year round. However no safari is ever the same, regardless of the time of year you travel; your driver, leader and/or local guides may adjust their route depending on the weather, what’s happening within the park and how long they have. In 2018, however, Peregrine has a brand new Limited Edition trip that takes in both Kenya and Tanzania. Travellers will spend four nights in a mobile camp specifically positioned for the Migration, experiencing the thrill of sleeping ‘under canvas’ in the African Savannah (but with all the creature comforts!). The trip is scheduled to depart in September, and is really one of those bucket list adventures. 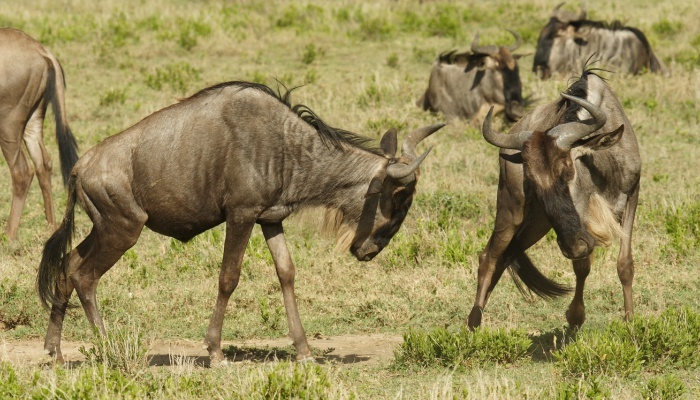 Wildebeest are funny-looking creatures! Image c/o P. Ellinger. The sheer volume of animals that form the Migration is hard to fathom, but it’s important to know that it’s not one giant collective herd. The herds are separated over hundreds of kilometres, so while you will see wildebeest and zebra whenever you travel, there’s no guarantee you’ll see them in huge numbers. Have an open mind! The Migration is a natural phenomenon, and no year – or no safari – is the same as the last. That’s what makes a safari so magical: there’s always a buzz in the air, a sense of childlike excitement when you head off into the unknown! It’s like nothing else. Along with our scheduled departure group trips, we have plenty of Independent Experiences that can be linked together to help you create your own unique holiday. Designed for one to three people, you can add them onto the end or beginning of a group trip, or mix and match to choose your own adventure. These tours depart daily (on request), and include expert local guides for all included activities, all arrival and departure transfers, and quality handpicked hotels, lodges and tented camps. With the freedom to explore on your own – it’s independent travel without the usual stress. Explore Peregrine’s range of small group trips through Africa here, and check out our special Limited Edition East Africa Migration journey here.